Forum » Contraptor Forum / Questions / Issues » The Most Exciting Contraption? Re: The Most Exciting Contraption? I have a project also: www.cubespawn.com, but it is still in a fairly preliminary state, I see this construction kit a a perfect way to explore new ideas within my project - this is so obvious its brilliant!! Hats off to your fine concept! This will make a huge contribution to accelerating the development of a whole spectrum of prototypes. For me, a pallet handling system, servicing multiple machines, will be quicker and easier to develop, using your kit. Thereby speeding up the process to automate open source component manufacturing. Cool stuff at cubespawn. It looks like 80/20 stuff right? Vitaly has got some 80/20 in some of his contraptor designs. Meaning, hes bought some 80/20 and incorporated it into the contraptor framework. Tell me more about the pallet handling system. Sounds cool. Transporting between cells are pallets that the workpieces or work holders are attached to. to use for servo accuracy. Perhaps we can collaborate on it. This looks great! Contraptor was envisioned for prototyping exactly this kind of stuff - home/garage/desktop manufacturing robots. I like the modular aspect of your cubes, I think modularity is one of the keys to open source hardware being successful through being faster to go from idea to implementation, software analogy I'm thinking of is high level SDK. It's true that for the same cost, Contraptor has wider selection of components of different lengths which allows to explore a lot of different designs. I think the choice of building material really depends on what you're building. I played with several Contraptor designs in Sketchup using 80/20 instead of angle and everything fits very nicely. I used 80/20 mostly for structure and Contraptor for linear motion. One potential problem is that 80/20 is heavier than angle and depending on design/configuration, it might require more powerful steppers (which might require more powerful stepper drivers and power supply). But generally, I see a lot of advantages in having several different construction sets which can all be interfaced with each other. 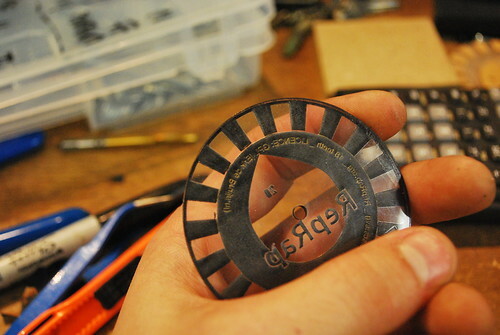 The objects can then be finished with a Dremel to spec without taking a lot of time to mill. I wonder if Shan Zhai factories use commercial pick and place equipment? Contraptor seems aimed at prototyping. either way I see a slightly different intent in the endpoint for the two approaches, and I think they are complementary - I really didn't consider the prototyping aspect much in the cubespawn design, just interchangability, stackability and modularity. I too wonder what Shan Zhai operations look like, and what machines are needed to build thier very sophisticated products on a small scale.. I have a meeting with a vacuum forming plant owner tomarrow to pitch the cubes as a labor saving trim-out line for 14 products in his plant - I am doing it for the development progress it will bring to the project - if it works out we all get the benefit of the developement - so I may drop off for a while, but will post finished designs as they happen - sorry this is getting so far off-topic - I would like to link to your site from cubespawn and state my position there: use Contraptor to explore implementation stategies, Then populate the cube with the solution. I hear you, yes this is true - prototyping, bootstrapping, building makeshift robots and exploring designs are what Contraptor was intended for, so for example long term reliability was not a design goal. As you said above, the goal is to accelerate the development of a lot of things that will then accelerate the development of even more things.. When you have built something from Contraptor that you can show, please feel free to create a page in this wiki with pics/explanations of your project, we'll definitely link it in the Contraptions page and let people know about it. Also, we can link from home page to your site if you're looking to attract contributors to your project. That sounds like exactly the goal: we can do a little to help promote each other's sites, as we promote our own, thereby accelerating the whole idea a little faster, and I'll do as you say: post designs that I'm using Contraptor to define or support. Hopefully we'll get people from both camps using the whole toybox to concieve, design, and then build and automate thier creations. First of, Hello all! I found this project and fell in love with it instantly, nice job!. I have decided to sell my 100 gallon saltwater-reef aquarium (that i've built mostly on my own) and use the money to put together a contraptor set! My goal is to make a cnc router, and create parts for people in my other various hobbies. If possible, though, I want to get a cutting laser (an overwhelming step at the moment) to cut balsa templates for my model airplanes, and to also etch stuff. I wonder if combining several high power diodes with some kind of mirror system would provide sufficient power for cutting thin wood. Then laser tube and expensive optics would not be needed. Oh cool. I was thinking of removing the IR filter from a green pointer laser and trying that, but a laser already made for burning is even better. I actually haven't taken the dive into researching the availability of burning lasers, since I figured I'm make the cnc first. I've thought about trying to combine the beam with a prism too. Then you could just get a bunch or IR laser diodes and set up something that could cut balsa. Oh yeah, I am also curious about making a hot-wire cutting head to cut foam. Foam is great because there are so many possibilities as to what you can do once you have a foam model of your part. (including casting it in metal w/ a "lost foam" casting method). Hotwire cutter should be relatively easy to do. What are the typical speeds of moving wire through the foam? I haven't looked up the speeds, but i'm assuming you could easily use a belt drive, but the precision of a leadscrew could be important depending on what you're casting. Actually, now that I think about it, I think a router bit would be a better option for foam than a hotwire (unless you really cared about the speed). High density insulating foam seems like it would be a perfect material to mill through as long as you kept the router bit slow to avoid glazing. With linear bearings, belt drive should be pretty accurate, but I think even 1/16 should be good enough in most cases of cutting something large from the foam?